Hashemi, Morteza. “From Ibn Khaldun’s Point of View Fidel is Not Dead: Or, What Does the Rise of The Donald Tell Us About the Future?” Social Epistemology Review and Reply Collective 5, no. 12 (2016): 13-16. What can Ibn Khaldun, the medieval philosopher of history, teach us about the simultaneous death of Fidel and rise of The Donald? The answer is: ‘wait for the return of the Fidel’. In The Orange Trees of Marrakesh, Stephen Dale writes about the genius social observation of the medieval Muslim philosopher Ibn Khaldun (1332-1406), who believed that one of the symptoms of a ‘dynastic senility’ is ironically the invigorating scent of the blossoms of the decorative orange trees (Dale 2015, 248). The popularity of the inedible (hence useless) fruit of those trees shows that the ruling dynasty is completely drowned in luxury. The rulers who pay for such decorative trees are neither brave enough nor trained enough to be ready for unpredictable future crises. The scent of the blossoms does show the beginning of a storm. It shows that the time of the dominant empire is over. The next crisis is likely to bring down the arrogant, thin-skin and luxurious rulers. Writing in North Africa at the end of the Middle Ages, Ibn Khaldun was considering the invasion of the Bedouins and nomadic people as the next crisis. The Bedouins, thanks to their life-long and effective training, were ready for serious battles. They could be a handful of people, but they were highly motivated, acting in harmony with the rest of the members of the group. The term that Ibn Khaldun used to describe their mutual attachment is ‘Assabiyah’ which means ‘social cohesion’ or ‘group feeling’ (Alatas 2014, 26). They were taking a bullet for each other. The worst vices of human being for the Bedouins were betraying a friend or a comrade. Hence, they were organised, trained and also work in group. Indeed, these features made them undefeatable. This is Ibn Khaldun’s image of history; a cyclical process of defeat of the sedentary society by the nomadic people, the civilization by the Bedouins, and the cowards by the braves. But after their victory, the Bedouins of today will be the luxurious, thin-skin, pleasure-seeking, cowards of tomorrow. He predicts that the triumphant Bedouins will become weaker and weaker by each generation. Lastly, the fourth generation of the rulers will be completely alien to the strict exercise regime of the founding fathers of their dynasty. The fourth-generation rulers will be the ‘city-boys’ who do not know anything about handling crises. In the meantime, somewhere deep in the desert a new generation of young Bedouins are getting ready for their harsh everyday life. Hence, they might be the next crisis for the inhabitants of the city. Many have tried to update Ibn Khaldun’s historical theory for our time. You can find an interesting attempt in Applying Ibn Khaldun by Farid Alatas (2014). But for now, I want to suggest that Ibn Khaldun’s theory gives us an analytic tool to learn a lesson about the future. What does the death of Fidel Castro and the simultaneous victory of Donald Trump tell us about the future? There are three main elements in Ibn Khaldun’s theory. (1) The environment, (2) the training system and (3) the final products of the dialectical relationship of the environment and the training system. These products are, in fact, two opposing human characters. In the North Africa of his time, the environment of the Bedouins was the desert. But in Fidel’s case that was the mountains of Sierra Maestra in Cuba. For three years, Fidel, Che Guevara and their small group of revolutionaries were hiding and fighting in the mountains. While almost all the powerful rulers of Cuba of the time as well as the US politicians were against them. Fidel’s group were unsure about their future. It was very likely that they will be imprisoned, tortured or murdered. Still they had the high degree of ‘Assabiya’ as well as motivation. This helped them to survive three years of guerrilla fight in the mountains. At 1953 when Fidel’s small group of revolutionaries were battling for survival in the mountains, Donald Trump was a six-year-old boy living in his parents’ multimillion-dollar worth property in New York. To his credit, Trump attended New York Military Academy (NYMA) at age thirteen, though a few years later during the Vietnam War he obtained four student deferments. This issue was addressed during the 2016 presidential race when he attacked previous Republican presidential candidate John McCain, who is a Vietnam War veteran. ‘The Donald’ mostly lives in the phenomenal towers that belongs to him. His current house is a Manhattan skyscraper named after him. Cannot you already smell the scent of the orange blossoms in the Trump tower—the trees without any edible fruit? In terms of the training system, Fidel and The Donald have two completely opposing experiences. Although, interestingly, both of them came from a wealthy family background. Fidel’s father was a relatively rich farmer. Nonetheless, Fidel consciously chose a revolutionary and anti-establishment approach. He was imprisoned, escaped, and afterwards never gave up the battle. Che Guevara praised Fidel in many of his notes about their epic struggle for survival in Sierra Maestra. For example he wrote: “Fidel marched at the head of a tiny guerrilla unit, and saw what no one dared to see; during those days of defeat he saw victory, and his wonderful faith in the power of the people sustained and inspired everyone” (https://goo.gl/RKbvL7). 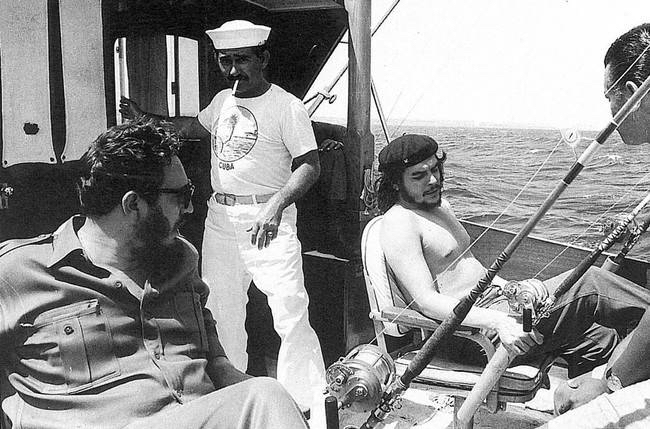 Moreover, Che could see that Fidel is not just a normal Bedouin but the incarnation of a revolutionary spirit. Again he wrote: “What sustained them [the Cuban revolutionaries] was a common ideal: Cuba. And they were driven by a faith that could move mountains: that of Fidel” (https://goo.gl/RKbvL7). Fidel’s ideology was a mixture of nationalism and Marxism, but still not reducible to any of them. Later on, at 1960s a journalist asked the leader of the Soviet Union if Fidel is a communist. Khrushchev answered that he does not know if Fidel is a communist or not. “What I know is that I am a Fidelist”, he added. True Bedouin don’t just talk the talk: They walk the walk. They are not interested in being what Kant calls ‘artisans of reason’ with an intellectually interesting ideology. The Bedouin rather embodies the idea. Comparing Fidel to The Donald on this aspect is also interesting. It is almost impossible to say what are The Donald’s principles. He has been a member of both of the major American political parties in the past three decades. If you search in his speeches, you can find almost everything. He is pro-choice and pro-life, against war and pro war, and racist and anti-racist. There is a simple reason. No principles guide his behaviour, other than selfishness, pleasure-seeking and the lure of worldly success. Trump’s hedonism joined to a radical individualism, from a Khaldunian point of view, is the greatest indication of the fourth generation of rulers without any moral compass. The fourth generation of rulers do not believe in any necessary universally valid principle because holding one true moral, political and religious principle is not an essential part of their environment. Because such a principle is the cornerstone of a training system which is a machine for producing strong fighters and rulers, one cannot find such a character in the city. The measure of success in the city is the individual. In the complex life of sedentary civilizations, that success might be in artistic or economic achievements—though such a success is unavoidably one dimensional. In other words, in the city one cannot be professional in everything. That is because the life of the city is too complex for that. One dimensional people are also dependent on each other. This reminds us what Emile Durkheim called the ‘organic solidarity’ (Durkheim 2014). Whether you prefer the ‘organic solidarity’ of the urbanites or the ‘mechanical solidarity’ of the Bedouins, Ibn Khaldun has bad news for the city dwellers: At the highest level of advancement of a civilization, people become weaker and weaker to the point that they cannot make the right decisions at the right time to handle the forthcoming crises. So, they become more and more fragile and insecure. If Ibn Khaldun were still alive, he would see that fragility and insecurity vividly in the American media representation of the US and the other countries. I have been a reader of The Economist magazine in the past five years. The magazine’s level of detachment from the real world of facts strikes me as astonishing. Just look at the cover photos of the magazine in the past two years. You will see the depiction of the US as the mighty, powerful and great country as always. While any sort of bad news in other countries means their destruction, failure, and the long-expected demise. You can see several depictions of the Chinese dragon falling into the sea, Russia’s failed propaganda, Iran and Cuba’s failure of the revolutionary projects. In The Economist’s fantasy world, everybody is doomed to fail, while ‘we’ win. It is a good example because The Economist is a relatively elitist magazine, not a tabloid. This illusion is the twenty-first century counterpart to the invigorating scent of the blossoms of decorative trees. No wonder that the American journalists could not even imagine the victory of Trump in the 2016th presidential election. them and psychologically stayed strong. Even he famously was joking about it: “if surviving assassination attempts were an Olympic event, I would win the gold medal”. Now compare this with the president-elect of the US. Trump has reportedly complained about his ‘unflattering double chin photos’ during a media meeting a few days after his victory in the election (https://goo.gl/PSoedW). Known as a thin-skinned person, he also publicly shows his anger about a TV comic portrayal of himself (https://goo.gl/zGDnzh). Yes, indeed Trump is the symbol of the end of an empire. It is noteworthy that the US was built itself by the Bedouins. In another coincidence, the year of the presidential election was the year of release of a highly successful Broadway musical about Alexander Hamilton; one of the Founding Fathers. He was a mixed race nobody from a poor family who moved to America and eventually became the founder of the US financial system. Still, we cannot predict who the Bedouins of the next dynasty are. But if we look at it from a Khaldunian point of view, Trump’s victory means that somewhere in an unknown small city, a distant desert or an unimportant mountain there is a Fidel who was just born, or an Alexander Hamilton who is learning to walk. We cannot predict who the new Bedouin of our time is but that person will put their country on the map. Just as Fidel did. Castro showed us where Cuba is located. He transformed a small country to a great challenge for a global superpower. Not only could Castro’s Cuba overthrow a US backed dictator but also change the rest of the world. Cuba was one of the few countries that helped Mandela in his triumph over the apartheid regime (https://goo.gl/hclNUC). The Cuba of Fidel was a significant international political actor. Havana after him was not merely another Las Vegas with decorative trees for the American tourists. Hence, the new Cuba might be Rwanda, Malta or one of those tiny island countries with a funny name. Alatas, Syed Farid. Applying Ibn Khaldun: The Recovery of a Lost Tradition in Sociology. London: Routledge, 2014. Dale, Stephen Frederic. The Orange Trees of Marrakesh: Ibn Khaldun and the Science of Man. Cambridge, MA: Harvard University Press, 2105. Durkheim, Emile. The Division of Labour in Society. New York: Free Press, 2104.